In PR, we often create client events to generate brand visibility. It’s normally not very difficult. But, in January, we were asked to pull together a media event – in this case, a reception and panel discussion – for one client in less than two weeks. One reason for the rush was that the discussion was related to a television show featuring our client, so we wanted to make it happen when the series was still airing. We sprang into action and pulled off the event with a marquee journalist as moderator, attended by over 35 journalists, and attracting over 100 attendees in a packed venue. Now, we don’t recommend a 14-day lead time, but the discussion was a wild success, in part because we knew how to accelerate our typical event management template. Here are five best practices for planning an event on a tight turnaround. With little lead time, most venues and vendors – from caterers to AV suppliers – will charge premium rates. They know you’re desperate; they can smell it. The key is to anticipate this and make sure all stakeholders are aware that a quick-turn event will cost more than is typical. Establish that early on and ensure that you have the necessary cushion to pull it off. This is a good rule of thumb for any undertaking, but when you have less than two weeks and every venue is booked, it pays to have a network for advice and connections. We turned to our digital networks to ask for recommendations. I posted on the NYC Tech PR Facebook group, for instance, which is a great resource for PR professionals and marketers. The venue we chose was ultimately recommended by a friend within that group. Every thought leadership discussion begins with a strong moderator. With a brand-name moderator or headliner on board, preferably from a relevant media outlet, panelists and attendees will follow. It helps to be aggressive in reaching out to moderators to determine who might be available or interested. In a smaller window, that might mean checking with multiple people in a given day. Whatever gets the job done, without spamming. Also, there are times when emails aren’t enough – and this may be one of them. Rather than waiting for responses, initiate calls, then send email as a follow-up. You’ll need to be as persistent as possible without irritating the people whose help you need. With our January event, we streamlined our process and vendors to ensure we hit our launch date. That means cutting elements that you might have had otherwise. Forget a save-the-date email, for example; send the full invitations as soon as possible, even if some featured participants aren’t yet confirmed. We ended up ditching a dedicated photographer, opting to use high-quality stills from the videographer we brought on. We also paid extra to have the venue handle security and coat check. With enough time, you can stitch these elements together to lower costs, but with a tight schedule, there would have been too much complexity. Our event spoke to a number of media verticals: entertainment (because of the TV show), advertising/marketing, business, and more. So, we were fortunate to be able to invite a wide assortment of media, while keeping the list very targeted within each category. Of course many media already had prior engagements on the calendar, given the late notice, which is a common problem for any last-minute event. With that in mind, we decided to expand our media invite list. Everyone was still relevant, but we broadened our criteria for attendance (their beat could be more comprehensive, included freelancers and contributors, etc.). If you find yourself hosting an event on short notice, inviting more and more media is critical. Keep in mind the drop-off rule: expect a 70% drop-off from your RSVP list. Being extra cautious will help you deliver. 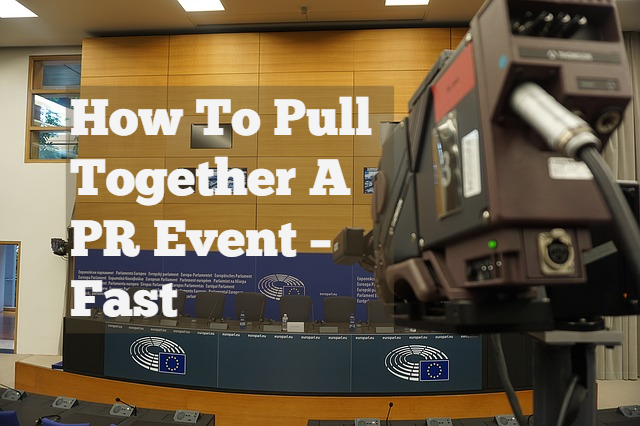 See our earlier post for a deeper dive into executing a successful PR event.